Again kicking off a huge weekend of motoring, the City Cruise will see a collection of unique cars and bikes. Spectators will have the opportunity to see the enormous collection of exotic vehicles parade their way through the streets of the Geelong waterfront on the Friday evening, finishing up in the waterfront precinct for a casual celebration. Vehicles are invited to arrive at the starting point, Sutcliffe Reserve (240 Plantation Road Corio) 6pm Friday 23rd for a 6:30pm start. 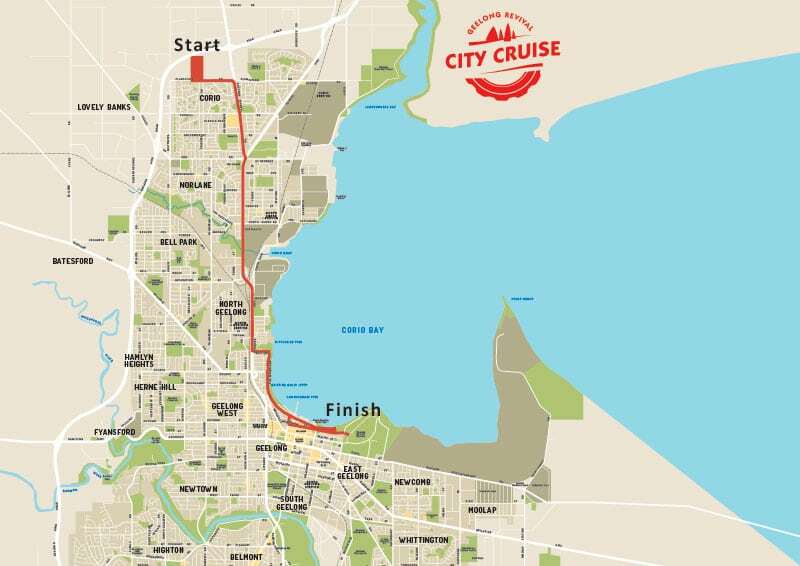 The City Cruise route will then continue onto the waterfront to park in the Geelong Revival event precinct. Once you have arrived, there will be a sausage sizzle and the Geelong Revival Pit Bar will be open from 7pm to 9pm. Get in early as the 1st 240 entries will get a park in the event precinct. Additional vehicles will be able to park on Herne Parade and walk down to enjoy the activities.